This year we did our Annual photo shoot at a YouStudios in Sydney. This is our third set of family portraits. I never thought I’d have an annual family picture, but it’s turned out to be a really fun tradition. Early on a Saturday morning we got gussied up and filled a giant duffle bag with props before heading over to their studio. Unlike previous places we’ve gone, YouStudios likes to do the photos in three sessions: shoot, review, pick up. For our first shoot, we worked with a super awesome photog who had us get up, down, and in some cases up in the air. Xavier is normally super camera shy, but she did a great job of bringing him out of his shell and getting him to smile for the shots. We ran through a few different sets of photos, including some sports photos of him in his soccer outfit. Back home, team photos are a pretty stock part of a kids sport. Down here I guess it’s not a thing. About a week later we showed up again for the review session. We arrived back at the studio and spent 40 minutes or so going through the choice shots of the previous session, and discussing layout options. Unfortunately, we then had a talk about price — this is when we found out that we were not at the same sort of place we were used to. The first option our photographer showed us was comparable in cost to a new laptop. Yikes!!! Considering we generally keep our walls bare, this was just so far out of the realm of reasonable we had to laugh. After some negotiating, Sarah found a plan that worked for her and was within a reasonable price point for what we were looking for. As an upside, our package also included digital copies that we can email around to friends. We spent this morning at the Wild Life Sydney Zoo. This is the third zoo we’ve been to in Sydney, and definitely number 3 on the awesome zoo experience list (after Featherdale and Taronga), but it has some major advantages. It’s super convenient to get to, it’s much cheaper than the others, it’s indoors – making it nice for rainy days – and it does have it’s share of Australian wildlife. Anything that you’d really like to see as far as local fauna goes can be found here. The other huge up side is that their crocodile, Rex, (or as Xavier calls him: snap snap) is by far the most active one that we’ve seen. This guy was pretty huge! The wombat is nearly always asleep. This is what the kangaroo pit looks like. Aaron the Koala. While we watched, he yawned and rolled over. The most action he’d seen all day! Xavier just realised he was standing in front of a 5 meter Crocodile. Enjoying a lolly on the walk home. Undoubtedly our #1 favourite thing about living in Sydney is the weather. By now we have acclimatised a bit, so it’s hard to remember exactly how good it is, but I get the occasional reminder when I travel. I was visiting San Francisco near the beginning of August, and it was pretty nice out, but still not that warm. Jeans, sweatshirts etc were pretty common wear around the city. And in the evening – Freezing!! So very, very cold. So, this is San Francisco in the height of summer. By contrast here’s the same set of days from Sydney. Keep in mind this is the dead of winter — effectively February 11 in the northern hemisphere. Those of you from Vancouver area might notice that for February weather, there’s an awful lot of yellow sky-ball. It does rain here quite a bit in winter, but it does it tropical style; with very intense, short bursts of rain. That said, the people down here still find it ‘cold’, choosing to winter a little further north near Brisbane, where the weather is a wintery 30 degrees. 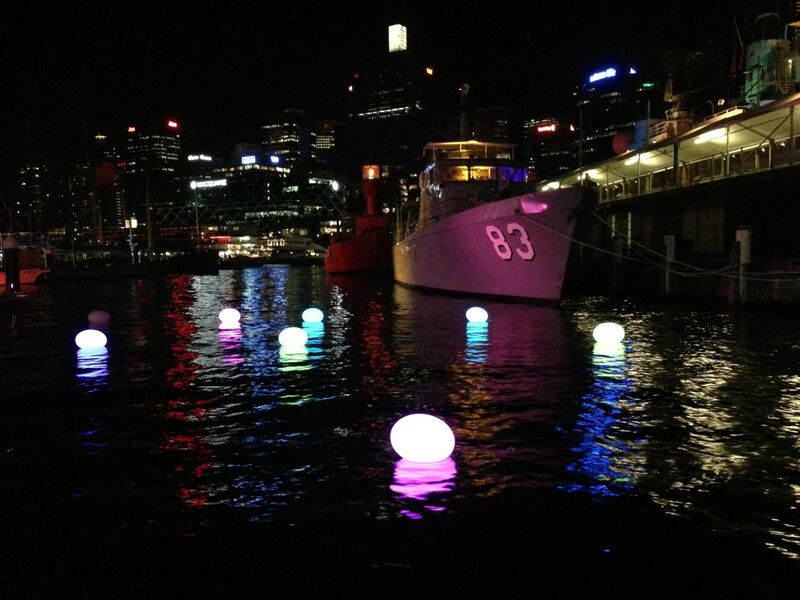 The Vivid festival was a few weeks back; this is Sydney’s annual light, music and ideas show… and it’s spectacular. For the last two years we’ve only really paid attention to the light show part of it. The music and ideas bits are interesting too, but more trixy to get to with toddler in tow. The lights, however, are a winner no matter what the age. This year, they added a second venue very near to our house, which we made it out two twice during the two week event. The second venue wasn’t as decked out as the main core, but it did have two awesome features. My favourite was the harbour water fountains. Each hour giant fountains of water would shoot across Darling harbour in a very carefully timed dance. As the jets died down, residual water droplets hung in the air and acted as a moving canvas for a playful light and music show that could only be seen or heard from certain angles nearby. The local maritime museum also transformed itself into a small bar, serving local wine and beer, with a kid friendly light and sound stage along the water side. We spent a good hour here while Xavier danced in the dark to Funk hits of the 70s. Others were equally stunning though. Sarah’s tops was the super dynamic presentation on the modern art museum. Mine was the interactive display on Cadman’s Cottage. 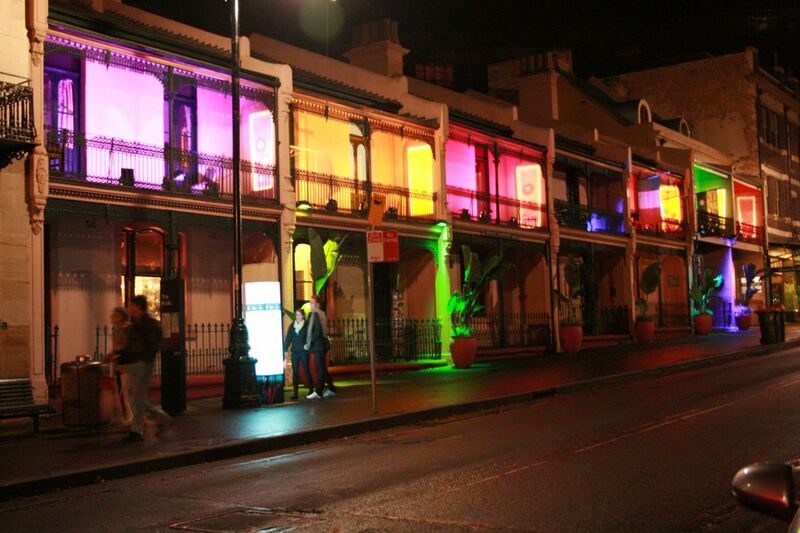 You could finger paint on an image displayed on an iPad, and see the results broadcast on the building live. Every 15 minutes the state was captured, tweeted, and reset for the next person to play. In these next three photos, some young girls were decorating with monstrous ladybugs. Xavier’s favourite defied pictures. It was essentially a trellised fairy light garden, 15 meters long. As you walked through, thousands of small lights flickered different colours all around you. Other displays were a little more tame, or unluckily broken down while we were visiting. Some were very elaborate – like an exhibit where light chased you as you moved across the sidewalk, or an interactive flower garden projected onto a wall that allowed you to swat at the virtual butterflies and flowers. Others were just pretty lights on an interesting surface.